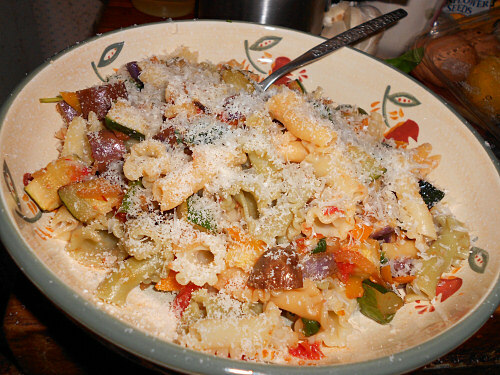 My selection from Giuliano Hazan’s Thirty Minute Pasta for Thirty Minute Thursday this week is Fusilli Arcobaleno…Fusilli with a rainbow-colored sauce. I used campanelle, which look like pasta lilies, instead of fusilli. Once again, I’m featuring ZUCCHINI… The sauce really is rather nice…zucchini, eggplant and tomato…with a bit of bell pepper and a dash of pepper flakes and a few other surprising ingredients…tossed with the pasta. This made a really great late-night supper for us. When it’s hot in the summer, we often don’t stop until it gets darkish…and that can be around 8-9 pm. It’s too hot to eat at “supper time,” but by 9-something it’s much better. This is just what you want on one of those hot nights…sauteed fresh veggies and herbs tossed with pasta and served with a crispy cold salad on the side. There was a nice balance of flavor, and a bit of “meatiness” from the eggplant and zucchini…just be more judicious with the red pepper flakes than I was…whoo! This is the best time of year for this cookbook. There are so many great opportunities to use fresh vegetables and herbs during the summer months. I love going out to the garden to “pick” dinner! If you’d like to cook your way through Thirty Minute Pasta, you’re welcome to join us! My email address is on the sidebar. As long as you get me your link by Thursday, that’s all I need…and the link to your post! I’d love to have you join along! Thirty Minute Thursdays: Spring-Summer Round up! I’ve been so bad about getting recipes posted for the past 2 months…but bless Kayte from Grandma’s Kitchen Table…she’s stayed the courses with me! LOL! At this point, I think we have about the same number of posts either published, or (in my case) ready to go… So…here we go! 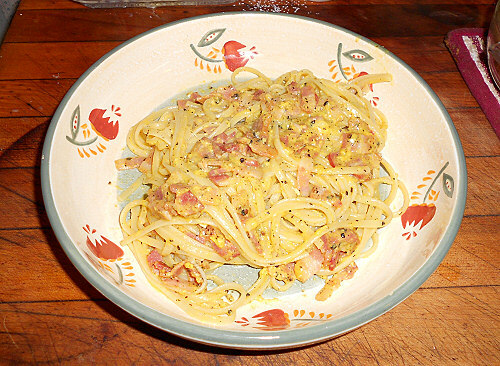 I love carbonara… It’s a great solution to a very long day…combines breakfast with supper, and helps me SLEEP. Big carbs…protein throughout, good taste… No…it doesn’t taste like scrambled eggs and bacon…this time I did use American bacon…it was handy! Yes…the sauce really was that yellow…it has to do with our chickens. They have lovely deep yellow yolks. A lot of my egg dishes are that yellow… This is an always welcome quick supper at our house. Little work, maximum enjoyment comfort food! Over at Grandma’s Kitchen Table, Kayte fixed Linguine al Pesto di Basilico (Linguine with Classic Basil Pesto). Isn’t that just gorgeous? She used fresh basil from her ONE little basil plant for this…Fabulous Kayte! Kayte fixed the other basil recipe this week and featured it with spaghetti…this dish is called Spaghetti al Pesto Ligure con Quayliata (Spaghetti with Creamy Basil Pesto). Although they look a lot alike, the difference lies in the sauce…One is classic made with olive oil and parmesan, the other is more creamy, being made with ricotta. 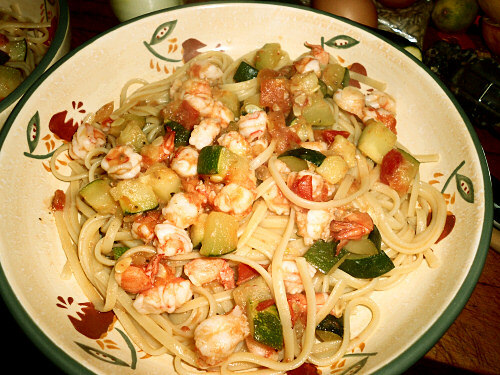 My dish this time around is Linguine with Shrimp and Zucchini. I’ll be featuring zucchini in almost everything for awhile…I should post about the many ways I’ve used zucchini lately…more on that another time… Needless to say, we have plenty of zucchini, so I went ISO (in search of) any pasta recipe containing zucchini…and I found several…which you’ll see as we go! 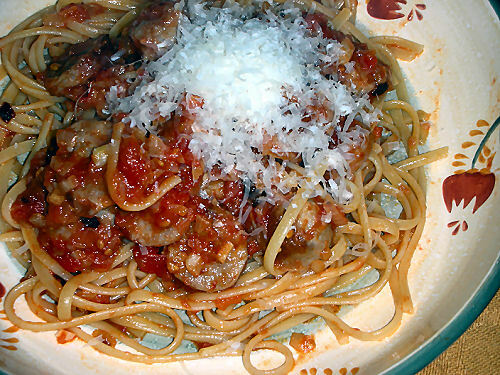 We liked this one, but it cried out for more seasoning…shhhh…we broke out the parmesan! That’s naughty because REAL Italians don’t use cheese with fish…very often…if at all… Oh well! 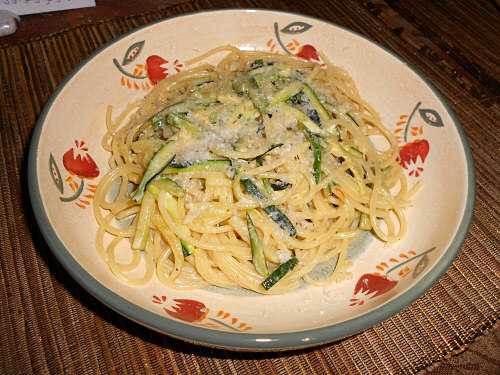 Next up we have….Spaghetti with Zucchini in Saffrom Cream…. This is probably the most complicated of any recipe of Giuliano Hazan’s that I’ve tried…and it’s still easy. There are just a few extra steps…simmering the saffron threads in the cream for instance… This has a different flavor from what we’re used to, and I think it shows Hazan stepping into a slightly different zone…it was really good, but I need to replace my saffron. *sigh* It’s not quite packing the punch it used to. Kayte, on the other hand, was equally adventurous at Grandma’s Kitchen Table…she fixed Spaghetti with Melon. I love Kayte’s post on this recipe…it feels like my own thoughts when I read the recipe! This is a keeper for her, but you’ll have to read her post to find out why! And doesn’t that just look seriously yummy?? I could sure appreciate sitting down to a plate like that! I was amazed at the taste of this…the bay leaves really give the sauce a unique essence… It probably would have been stronger without the basil chiffonade….but gotta tell you…it was pretty WOW!. This one’s a keeper! And with the tomatoes starting to come on in the garden…it’s going to be “What do we do with tomatoes and zucchini?” for awhile! Incidentally…had I been on time…this would have been my submission to Food ‘n Flix for shhh…May…to go with Under the Tuscan Sky. I’ve really had a full life and then some DEEP recharging! I’ve read, I’ve watched, I’ve cooked…I haven’t posted! LOL! If those are my greatest worries or skinned knees…I should be so lucky! This week finds us with zucchini in the fridge, and some polish sausage that was nice and spicy! What a great combination! I used Giuliano Hazan’s basic recipe, but cooked things out of order because the sausage was already fully cooked. I still used fresh tomatoes for the sauce though. Everything came together very quickly…the zucchini cooked in the pan with the other veggies and was nice and tender by the time the pasta was ready. Still in under 3o minutes…gotta love it! Meat, veggies and pasta, all in one dish. Wonderful for a working woman who sometimes has to put dinner on the table late in the evening! This is another keeper…especially when we have zucchini and tomatoes going bonkers in the garden. I’m sure that will happen sometime…when Mother Nature remembers what season it actually is! 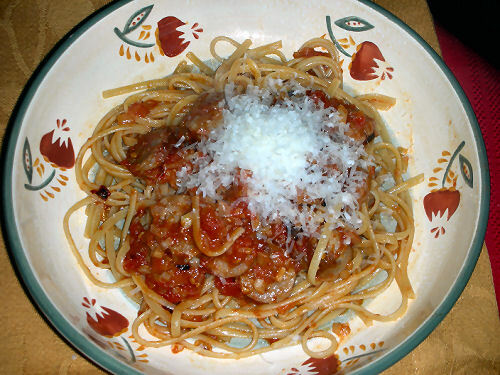 The sauce took on a lot of spiciness from the sausage…kind of like an Arrabiatta sauce. Yumm! I’m excited to welcome Andrea from Family & Food & Other Things! Andrea’s first post is of Pasta e Bisi, or Pea Soup with Pasta. What a great soup!! Kayte is quiet this week…I imagine things are really beginning to bustle in the house of Grandma’s Kitchen Table. Kayte has a college-bound senior getting ready to graduate from high school, with all that means. She has every reason to be very proud of her son, and I hope she savors every moment as he closes his “High School Years”. Cooking will wait! Way to go Matt!! It’s been a busy couple of weeks. For some reason, Spring is just that way in my life. Last year I know I was cooking for something, someplace about this time… This year is no different. Last week was a FREE spaghetti dinner put on by our PTO for the school kids and parents. Not many people are familiar with cooking for a crowd. It was a great learning experience! This week has been Teacher Appreciation Week, which culminated in a Mexican luncheon today. I’ve done a LOT of cooking lately. Not much of it was what was on my “wish” list though! 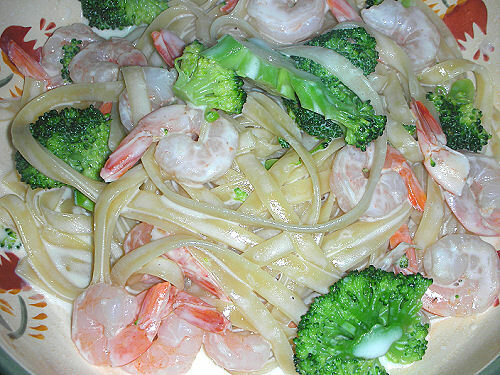 Last week I fixed Pasta Primavera from Giuliano Hazan’s Thirty Minute Pasta, and I added shrimp. I know…not wholly authentic. My bad. *giggle* It sure did taste good for being bad! The base recipe was perfectly simple… I confess. I blanched my broccoli and carrots in the water before I cooked the pasta. Everything cooked just right for me. I have to admit that I love this because of its simplicity and covering all bases for me at one time. 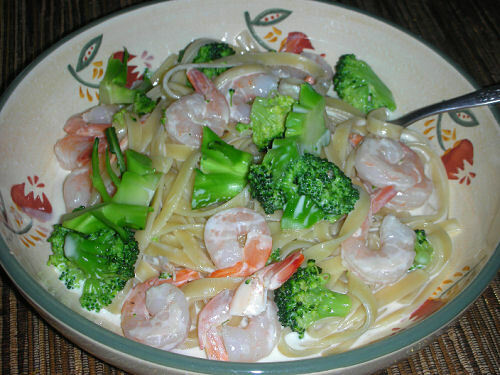 The shrimp were flash poached and then just tossed with the sauce when the vegetables are added to the primavera sauce. One of these years I’ll get the hang of the” Giada Twirl”… Have you ever paid attention to how she twirls her pasta strands in such a pretty little swirl? Pay attention some time…it’s really a lovely presentation! Bless Kayte from Grandma’s Kitchen Table! Kayte has been managing to keep up with TMT, even with Senior activities and swimming! Not to mention the fact that she does work on the side too! Kayte has been souping it up…Last week she created Zuppa di Pasta e Broccoli…a clear broth with pasta and broccoli. It looks like a great into to a more complicated dinner, or a really nice, light lunch soup. Kayte gives an excellent notation on the differences in pastas and how they absorb liquids differently. This week, Soup Queen Kayte prepared Minestra per i Bambini, or Children’s Soup. Kayte notes this is a good pantry cleaner…good for using up odd bits of pasta…“Not necessarily a recipe this week to wow all your guests, but a nice homey recipe that rose to the occasion of a quick lunch on a cold and overcast day like today.” Sounds like it would be good today, here! If you’d like to cook with Kayte and me, just send me an email, the link is in the sidebar on the right… I’d love to include you in our weekly round-up on Thursdays. I promise to try to get my life BACK under control soon! LOL! Usually I’m content to cook a recipe, as is, from Giuliano Hazan’s Thirty Minute Pasta, but not this week. I was in the mood for something a little on the spicier side. To make sure I stayed within the “allotted” 30 minutes, I began with my pasta water and went from there. 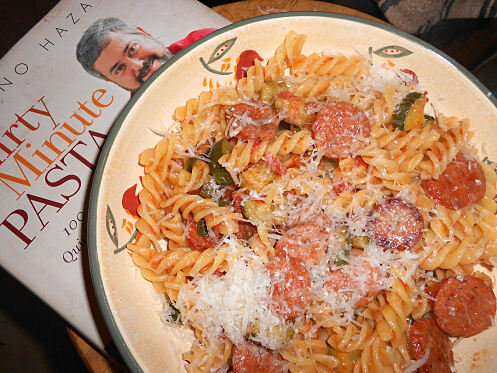 I began with Giuliano’s recipe for Fusilli with Sausage, Ricotta and Fresh Tomatoes… Changes: 1) Exchange Sweet Italian sausage for the recipe sausage; 2) exchange linguine for fusilli; omit ricotta and add granulated New Mexican chilies courtesy of Marx Foods. I was after a spicy Roman style sauce with sausage that could stand on its own. I think I got that! 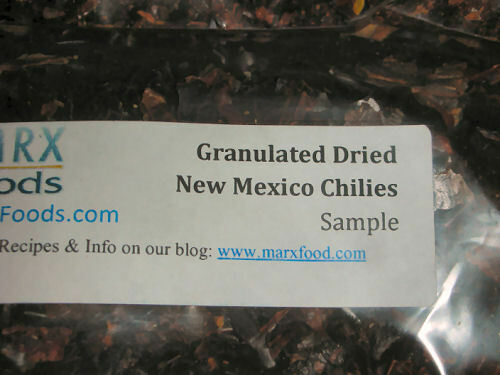 I’m participating in Marx Foods Chile Sampler trials… They graciously sent me a box of six different granulated dried chilies to try in the kitchen. This is the first recipe I’ve used them in. I was trying to lean away from the obvious…at least somewhat! 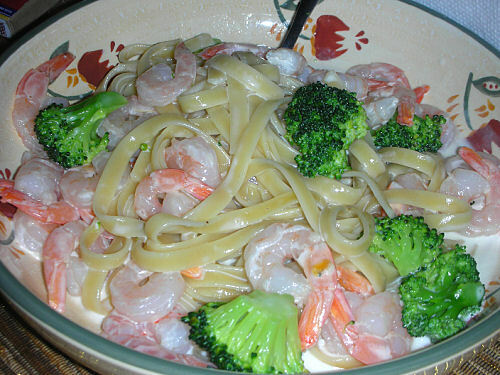 Start your pasta water…at least 3 quarts for 1/2 pound pasta, 4 quarts is better. Cook the sausage until it’s done, set aside to add to the sauce later. When you add the pasta to the boiling water, begin to complete the sauce. Saute the onion in the oil until translucent and beginning to turn golden. Add the garlic and stir. Add the tomatoes, if whole, chop before adding to the pan. Add the granulated chilies. Reserve the liquid from the tomatoes. You may need some to thin the sauce (cooks quickly, and the tomato liquid has a lot more flavor than water). 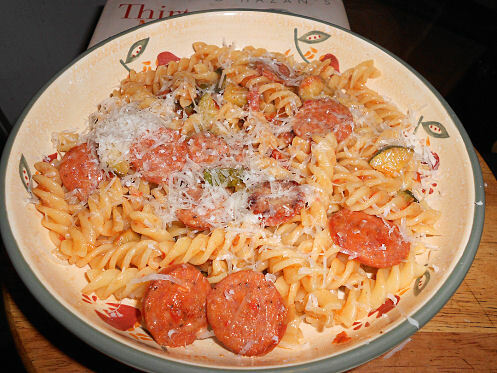 Add the sausage to reheat before adding in the pasta. When the pasta is done, drain and toss with sauce and the Parmesan cheese. Serve with additional Parmesan at the table. I have to admit that we really liked this. It had some low lying burn, but not much…you had to think about it. I’d try a hotter chile the next time. The sausage didn’t over-power the dish, but added a nice little flavor. 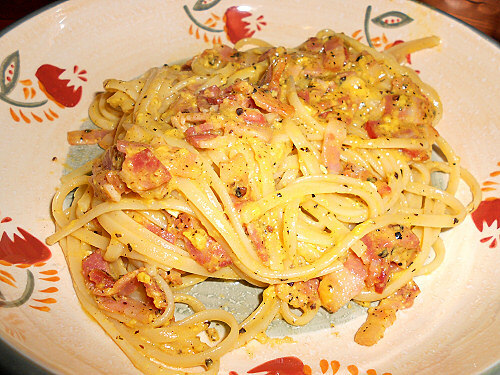 Using the linguine was nice…similar in heft to bucatini, but not quite as hefty. All in all, a relative success! If you’ve picked up a copy (or Kayte has made the recipes look so good and so easy that you can’t resist!) please feel welcome to drop my an email…the link is on the sidebar…and join us! Round-up is on Thursday, the recipes are free choice. I’m even okay with you going a bit rogue now and then! LOL! One of my favorite rogue recipes will end up here some night. I’ll share! The school year is drawing to a close (final third of the year), and things are getting the better part of my energy during the day. I just haven’t been able to get these round ups posted on Thursdays! Even though I cooked my dish on Sunday! LOL! This will get better soon. Spring Break is still just around the corner! Now…let’s get to the fun stuff!! 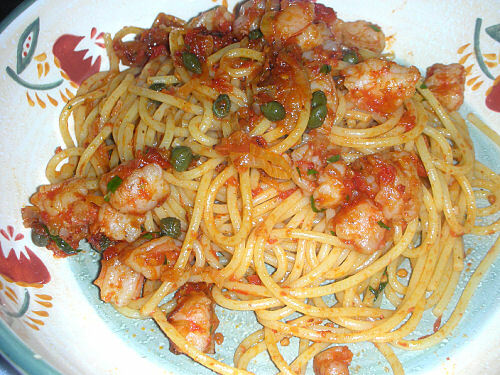 My selection from Thirty Minute Pasta this week is Spaghetti with shrimp, tomatoes and capers. I had some calamari that I needed to cook, and this was a really nice follow up to Marcella Hazan’s Calamari Fritti, or Fried Calamari. I was hungry for seafood, and this was a really satisfying pairing. 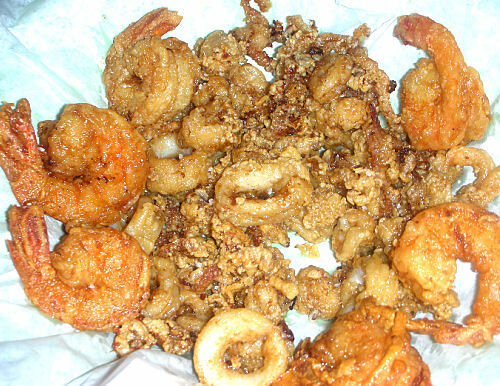 The recipe for the calamari is incredibly simple, and is found in Marcella Hazan’s Essentials of Italian Cooking. The book is certainly worth the purchase! 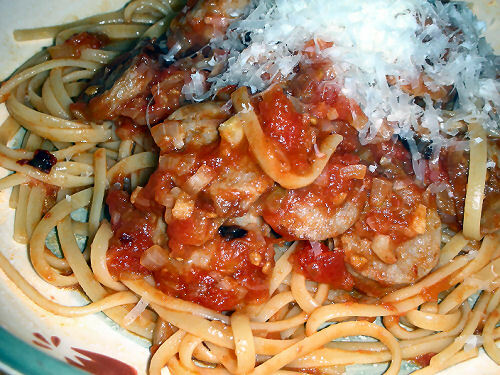 Marcella cooks old style Italian, and explains her recipes as she goes. It’s no wonder her son grew up to be a teaching chef! Chaya didn’t get a chance to drop by this week, but she had a post in reserve…just in case! Her post at Bizzy B. Bakes features Penne with Peppers, Fresh Tomato and Parsley. 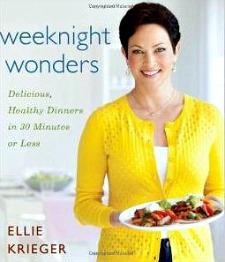 This was the first recipe Chaya tried from this book, and she really seemed to enjoy it. She has since found, as did I, that there’s a lot of repetition in recipes. There will be recipes that are almost exactly the same, but using a different pasta. 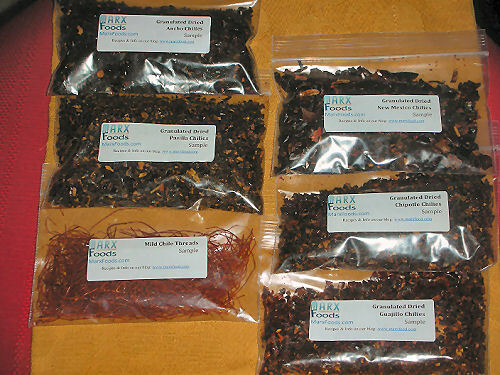 There’s also little seasoning, aside from fresh herbs and vegetables. That doesn’t suit everyone equally. Chaya has discovered she would like to play more with the recipes, and I’ve told her to have a great time! I know myself that after a few recipes, I was really getting the feel for what I was doing. I wanted to get more adventurous!! I have no problem with anyone doing that! I want you to ENJOY what you’re cooking! If something doesn’t quite work or you want to add some personal touches to one of the recipes…by all means! Yes…even if it means 30 Minutes becomes 3 hours! LOL!! I’m not BIG on rules…but I am big on enjoying yourself and doing what is best and acceptable to those you’re feeding. Food is a kind of love gift. Be happy with your gifts! Speaking of happy…Kayte at Grandma’s Kitchen Table was happy with her Fusilli ai Porri e Cipolla Rosso (Fusilli with Leeks and Red Onions). She said this is great if you like onions! Light, and as easy as boiling water and sautéing onions! They love onions (as do I) and really enjoyed this dish. It’s very pretty too! Thanks for stopping by…and if you’d like to cook with us, pick up a copy of Thirty Minute Pasta and drop me an email! Anyone is welcome! First in this week is Kayte from Grandma’s Kitchen Table. Kayte prepared Fettucine al Gorgonzola. I absolutely love her presentation… The prepared dish is very plain in color, however, Kayte gave it the most regal presentation with a beautiful blue drape. She also says the dish has a “great flavor punch” and that it’s sinful. Sounds like a keeper! Chaya, from Bizzy B. Bakes and Sweet and Savory has created her own adaptation of Tagliatelle with Peas. Chaya’s primary changes included omitting the onion altogether and using goat cheese. What a great idea! And what a fun twist! 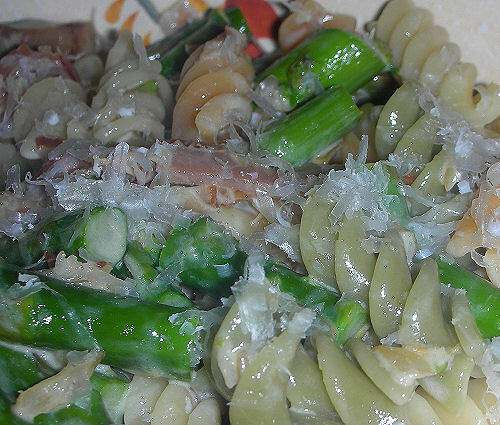 As for me, this week I chose to make a twist on Hazan’s Penne with Asparagus and Prosciutto. This recipe calls for just a few ingredients and goes together very quickly. A quick simmer and sauté, and it’s all finished. This is a great example of how easily you can change from one kind of pasta to another. The trick is to evaluate what kind of sauce you’re making and then match it with the right kind of pasta. 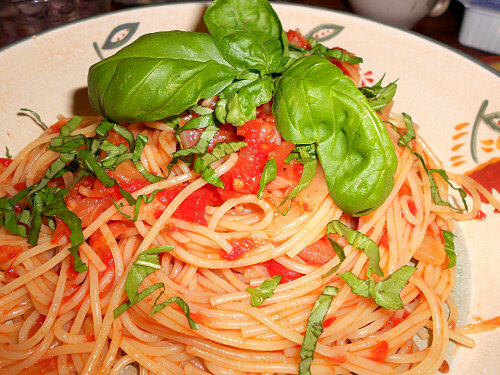 When you have a smooth, thin sauce like seasoned olive oil, it’s best to use a thin pasta like a spaghetti. Heavier or chunky sauces go wonderfully with pasta that has ridges or ripples…such as penne, fusilli or radiatore because the sauce will catch in the riffles of the pasta. Creamy smooth sauces are best suited for long, thin-but wider, pastas like linguine and fettucine, or even the wider shapes…but use care, because there’s more pasta surface that will soak up the sauce very quickly. This is obviously a keeper. 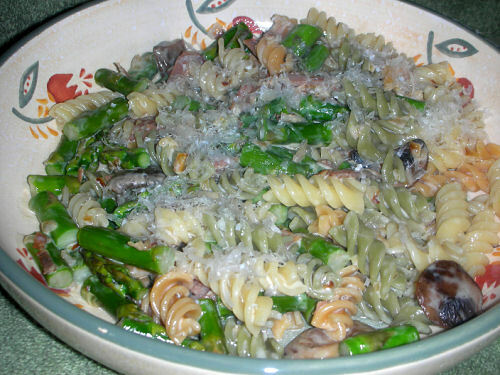 It’s a great recipe to use up the last little bit of prosciutto, and it’s wonderful with bright fresh asparagus! This time around, I also added in some sauteéd mushrooms…just another little layer of flavor and texture. They stirred in wonderfully! 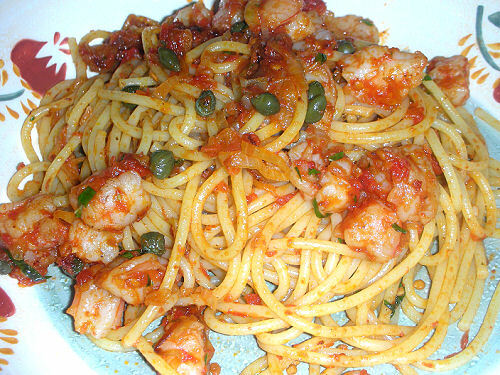 This is a really quick recipe…cooking the pasta is the longest part of the dish! If you’d like to join us, you’ll need to pick up a copy of Giuliano Hazan’s Thirty Minute Pasta…you can either put his recipes together as they are, or use them as an inspiration to stretch beyond! If your adaptation takes more than 30 minutes…we won’t penalize you! 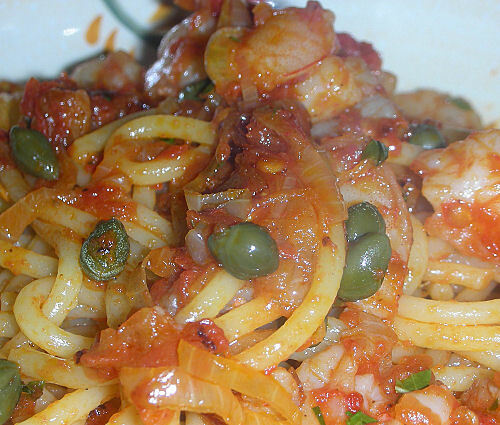 After all…some Italian dishes are really meant to be cooked slowly and lovingly. Our primary focus is learning new things, getting comfortable with the procedures, having fun creating and sharing what we’ve done! I’m using Thirty Minute Pasta as a vehicle to get me there…and all rules have to have a certain amount of flexibility built in!